To Cite: Sanaei Dashti A, Taheri S, Jouybar R, Hashemnia M, Karimi A, et al. Respiratory Burst Process in Diabetic Children, Iran J Pediatr. 2016 ; 26(3):e3989. doi: 10.5812/ijp.3989. Background: Increased rate of infections in diabetes mellitus (DM) is an accepted fact. Pathophysiologically, several tasks of the immune system could be involved including polymorphonuclear (PMN) functions. Objectives: The aim of this research was to evaluate the respiratory burst process of PMNs that is an essential part of phagocytosis, in children with DM. Patients and Methods: Fifty two children with insulin dependent diabetes and 29 non-diabetic children were enrolled in this cross sectional study from 2010 to 2011. Nitroblue tetrazolium (NBT) test was done on PMNs taken from their heparinized blood. The resultant data was analyzed by SPSS version 16. P values were considered significant when it was under 0.05. Results: Mean NBTs were 72.1 ± 15.84 and 94.68 ± 5.31 in diabetics and non-diabetics, respectively (P < 0.001). Using Pearson correlation, there was no significant correlation between the NBT level and age, gender, duration of diabetes, daily insulin usage and blood HbA1C level. Conclusions: Compared to non-diabetics, respiratory burst process of polymorphonuclears is obviously decreased in diabetic children. This can explain one of the mechanisms involved in the increased rate of infections in DM. Increased rate and severity of infections and sepsis in diabetes mellitus (DM), is an accepted fact (1-3). Patients with DM constitute to 20.1% - 22.7% of all patients with sepsis (4, 5). Distinct infections are more common in these patients, including necrotizing fasciitis, diabetic foot, mucormycosis, emphysematous infections of the gall bladder, kidney and urinary bladder, and invasive otitis externa (6-8). In a year round prospective cohort study, 705 adult patients who had type 1 DM, 6,712 adult patients who had type 2 DM and 18911 control patients who had hypertension without diabetes were compared regarding the incidence of infection. The result documented in patients with type one and two DM had increased risk for urinary tract, skin and mucous membranes, and lower respiratory tract infections (9). The association between DM and tuberculosis was first documented by Persian scientist Avicenna, who lived from 980 through 1,027 (10). Many aspects of the immune system are investigated in the diabetics and evidences of some disturbance are present now. Impaired chemotaxis and phagocytosis of the monocytes (8, 11) and impaired macrophage function in DM (12), also impairment of the lymphocytes proliferative response to different stimuli of diabetics with poorly controlled disease are presented before (13). Furthermore, an abnormal delayed type hypersensitivity reaction in DM type 1 and type 2 patients is demonstrated (14, 15). There are conflicting opinions regarding the status of the humoral immunity in DM. Some research finds normal antibody concentrations in patients with DM and good response of them to pneumococcal and intramuscular hepatitis B vaccine (16-18). However, lower immunoglobulin levels are demonstrated in some studies (19, 20). In a study in U.S., no significant association was found between diabetic patients and non-diabetics after immunization with typhoid vaccine (21). Polymorphonuclears (PMNs) are an essential component of the human innate immune system. It is stated that the major functions of PMNs including chemotaxis, adherence, phagocytosis and intracellular killing of microbes, are impaired in diabetic patients that have been attributed to the hyperglycemia, a process that could be reversed by insulin treatment and better metabolic control (9, 22). A couple of studies have illustrated a decrease of microbial killing in the presence of hyperglycemia (23, 24). Controversial findings regarding the effect of hyperglycemia on phagocytosis are published (7, 24-26). Phagocytosis as one of vital PMNs functions has several steps including generation of microbicidal oxidants to kill bacteria in the phagosomes. The microbicidal products, named reactive oxygen species, consist mainly of superoxide anions and hydrogen peroxide that are produced in a process termed “respiratory burst”. This pivotal process involves the enzyme complex known as the reduced nicotinamide adenine dinucleotide phosphate (NADPH) oxidase, which is responsible for transferring electrons from NADPH to O2, resulting in the formation of superoxide anion. The antimicrobial function of polymorphonuclears is supposed to be inhibited by hyperglycemia, due to G6PD inhibition or alteration of NADPH in the polyol pathway (25). Focusing on phagocytosis and specifically “respiratory burst” process of PMNs, this study was designed to assess this important step of microbial killing in diabetic children, and compare it with a control group of non-diabetic children. This cross sectional study was accomplished in Mofid children’s hospital, an academic referral center, affiliated to Shahid Beheshti University of Medical Sciences, Tehran, during an eight month period terminating at January 2011. Totally, eighty subjects were enrolled in the study. Fifty two of them were diabetic children and 29 healthy ones. Five milliliter heparinized blood was collected from each patient and mixed equally with 3% dextran. It is recommended to mix the blood and dextran in a syringe. The mixture was incubated at 37°C for 30 minutes and then the neutrophil enriched plasma was transferred to a 15 mL falcon tube. The plasma was centrifuged for 10 minutes at 1,500 rpm and the pellet was washed with 1 ml of distilled water for 30 seconds and then 5 mL of phosphate buffer saline (PBS) was added to resuspend the cells. The suspension was centrifuged at 1,500 rpm for 10 minutes and the pellet was re-suspended in 1 ml PBS and the number of cells was determined with a hemocytometer. The cells were adjusted to 2.5 × 106 cells/mL. Fifty microliter of the adjusted cell suspension was added to 50 μL of previously prepared nitrobluetetrazolium (NBT)/PMP reagent. The mixture was incubated for 30 min at 37°C. After incubation, the mixture was centrifuged at 1,500 rpm for 3 minutes. The pellet was collected with a 10 μL sampler and a smear was prepared from the cells in a bullet shape and then stained with Gimsa for 10 minutes. 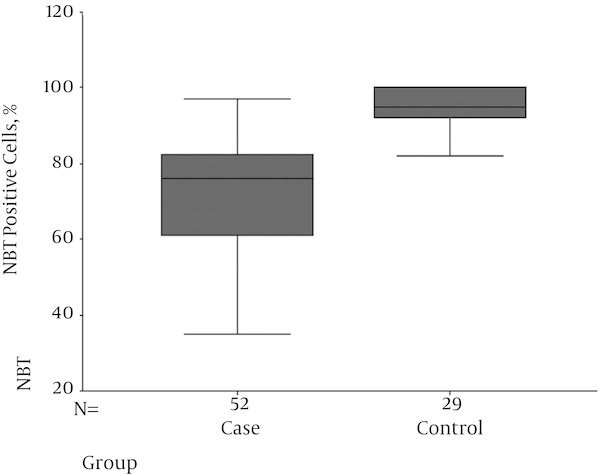 The neutrophils were observed using oil immersion lens and the percentage of the neutrophils which were positive for reduced NBT and formazan crystal, was reported. Staining of all specimens was performed by one person who was expert in NBT test. Analysis of reduction in NBT was assessed in a blinded manner. Among patients 44.3% were male and 55.7% female (Table 1). The mean age of diabetics was 102 months (8.5 years) with the youngest being 21 and the eldest 180 months. Mean duration of diabetes was 25 months. The mean age of non-diabetics was 77 months (6.4 years) with the youngest being 13 and the eldest 180 months. Mean NBT in diabetics was 72.1 ± 15.84 and in non-diabetics 94.68 ± 5.31 (P < 0.001) (Figure 1). The mean level of HgA1C was 8.29 and mean daily injected insulin 16.54 units. All the diabetic patients and the non-diabetics had normal blood urea nitrogen and serum creatinine. Using Pearson correlation, there was no significant correlation between the NBT level and age, gender, duration of the disease, daily insulin usage and blood HgA1C level. DM is associated with an increased frequency of infections (1). According to Joslinʼs findings in the time previous to insulin era, from a series of 1,000 cases, diabetic coma was usually caused by infection (1, 27). So, infection remains an important cause of death in diabetics (28). In a separate study, among 1,000 hospitalized patients, 2/3 of bacteremias were found in patients with DM comparing to 1/3 in patients without diabetes. Consistent with these results, diabetic patients developed septic shock in 22% and super infections in 22% of the episodes versus 15.6%, and 11%, respectively of the non-diabetic bacteremic patients (P < 0.05 for all comparisons) (29). This increased rate of infectious events in DM has persuaded the investigators to assess the capability of different functions of the immune system, including the bactericidal ability of the PMNs, but despite carrying out several researches, there are still conflicting results regarding the bactericidal ability of PMNs in DM. Spirer et al. (30) showed that the NBT reduction test is normal in well-controlled diabetic patients, and in diabetic acidosis there is a significant decrease in this ability during phagocytosis. According to Pujol-Moix et al.’s (31) study there was no significant difference between the NBT levels of diabetic patients and normal individuals. Furthermore, despite the expectation, NBT reduction did not increase in response to infection in diabetic patients with bacterial infection compared to a corresponding group without infection. Yun Woong et al. (32) assessed NBT and stimulated NBT test with E. coli endotoxin in four groups, including 27 healthy adults and 10 diabetic patients without bacterial infection. The absolute numbers of NBT-positive neutrophils in NBT test in two situations of with and without stimulation were not significantly different between healthy adults and diabetic patients. In a study by Niethammer et al. (33) on 10 diabetic children, the NBT-index and intracellular killing of Candida albicans were normal. Despite abovementioned researches that are not in favor of changes in intracellular killing capacity in DM, there are several studies that demonstrate the abnormalities of NBT. Walter’s research in 1971 showed that PMNs from normal and non-diabetic individuals had a higher NBT and phagocytic index than those of diabetic persons (34). In a study on 6 to 18 year old individuals, PMNs of forty normal and thirty diabetic children were assessed for phagocytic and bactericidal activity of PMNs. The duration of diabetes was from 1 to 12 years. The PMNs of diabetic children demonstrated decreased capacity for intracellular killing of bacteria compared to normal individuals (35). In other research, chemotaxis, phagocytosis, adherence, bactericidal activity and NBT reduction capacity were studied in 58 type I diabetic adults. Bactericidal activity in diabetics was decreased compared to non-diabetics (36). Our study as a properly designed research with adequate number of enrolled insulin dependent diabetic children proved the significantly lower bactericidal potential of PMNs of the diabetic children compared to non-diabetic children. The correlation of hyperglycemia and respiratory burst is yet a matter of controversy. Daoud et al. (24) evaluated the PMN functions of cells isolated from the diabetics and control groups in different concentration of glucose and demonstrated that hypoglycemia lead to alteration in immune cells. In their study, there was a significant reduction (25 to 35 percent) in the respiratory burst activity in patient with diabetes compared to controls. In other studies, after stabilizing the diabetic state, the activity of the granulocytes improved, but still remained below that of healthy persons (25, 37). We measured glycosylated hemoglobin HbA1c that is a fraction of hemoglobin to which glucose has been non-enzymatically connected in the bloodstream (Nelson Textbook), as a reliable index of glycemic control of the patient during the approximately previous 120 days. In children, values of 6% - 7.9 % denote a good metabolic control, values of 8.0% - 9.9 %, fair control, and values of 10% or higher, demonstrate a poor control state (38). Mean HbA1C in our patients was 8.29% indicating a fair control state. There was no correlation between the HbA1C level and the NBT activity. The respiratory burst phenomenon is obviously decreased in diabetic children, which can explain one of the mechanisms involved in the increased rate of infection in these patients. We would like to thank pediatric infections research center affiliated to Shahid Beheshti University of Medical Sciences, Tehran, for their financial support.